Mary first wore the brooch privately during her honeymoon at Osborne House. 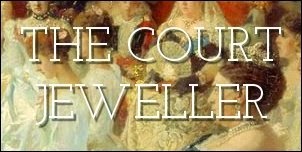 It wasn't exactly a private or casual getaway; George and Mary were staying with Queen Victoria, so there were plenty of opportunities for her to wear her new jewels. Mary was also photographed in the Richmond Brooch in 1896. A year later, she wore the brooch (along with basically the rest of the contents of her jewelry box) at the famed Devonshire House Ball. You can spot the piece being used as a pendant on Mary's pearl necklace in the portrait above. The brooch was among the jewels that the Queen inherited from Mary in 1953. It's a little tough to see, but she's wearing it in the photo above, taken at the opening of parliament in New South Wales in 1954. On that occasion, she paired the brooch with the Lover's Knot Tiara and Queen Victoria's Golden Jubilee Necklace. Although she only wore it sparingly during her early reign, in recent years she has worn it fairly regularly, both with the pendant pearl drop and without. The brooch most recently appeared in public in 2014, when the Queen wore it at the Festival of Remembrance in November.